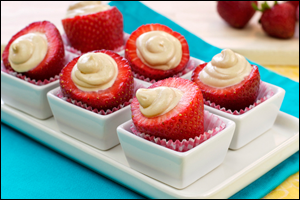 Creamy PB flavor packed into big juicy strawberries... YUMMMM! Shocker alert: Those infamous single-serve cherry pies sold at convenience stores can have around 500 calories and 20g fat! 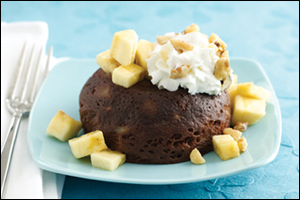 Our perfectly portioned microwaveable dessert, on the other hand, is shockingly guilt-free! 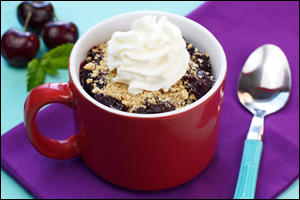 Place thawed cherries in a large microwave-safe mug sprayed with nonstick spray. Add cornstarch, sugar, cinnamon, and salt. Stir to coat. Microwave for 4 minutes, or until thickened. Let slightly cool, about 10 minutes. Sprinkle with crushed graham cracker, and top with Reddi-wip! Good thing we've got a whole book of guilt-free dessert recipes: Hungry Girl 200 Under 200 Just Desserts! Fans of single-serving sweets should go straight to chapter one: "Cake Mugs & More Desserts in a Mug"! And to track down ALL of the desserts for one in the book (including SIX whoopie pie recipes), flip to page 351 for a full list and page guide. Hooray! You won't want to share your single-serving desserts, so share the recipes instead! Click "Send to a Friend" NOW. Did you know that July is National Baked Beans Month? We've got an incredible recipe that doesn't even require cranking up the oven!